Gummy vitamins have not just gained popularity among children, at whom the product was pitched initially as an attractive alternative to bitter pills, but also among adults who are health conscious and want to better their life expectancy. As a result, their market has been seeing steady progress. In order to grow their market shares, most players are investing in product development. This has resulted in an array of gummy vitamins having different colors, shapes, and sizes. This has also had a major positive impact on the market. Currently, among the various companies operating in the gummy vitamins market, Bayer AG holds a dominant share because of its diverse product portfolio, growing spends on product development, and solid geographic outreach. A report by Transparency Market Research expects the global market for gummy vitamins to rise at a steady CAGR of 5.2% during the period between 2017 and 2025. Expanding at this rate, the market will likely become worth US$4.17 bn by 2025 from US$2.68 bn in 2016. The two main types of gummy vitamins purveyed in market are single vitamin and multivitamins. The single vitamins can be further categorized into biotin, vitamin C, omega & DHA, CoQ10, vitamin D, melatonin, high-fiber formulas, etc. Of them, the multivitamins account for a major market share because of the popularity of multivitamins supplements and development of new formulations in taste and shape of gummy vitamins. In the years ahead, the multivitamins segment is expected to be propped by a comprehensive supply chain and distribution management of nutritional supplement manufacturers, superior production facilities of companies across the globe, and innovative product offerings. The single vitamins segment too is projected to grow at a healthy clip due to demand for Vitamin D supplements among all age groups and rising usage of omega-3 DHA among pregnant women. 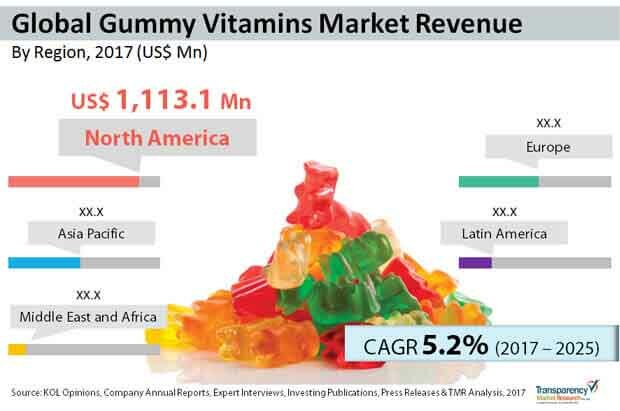 From a geographical standpoint, North America leads the global gummy vitamins market with maximum share. High uptake of dietary supplement among health-conscious adults and the elderly, who want to up their daily nutrient intake, has served to majorly boost the market in the region. Other factors stoking growth in the market are thrust on product development by keen players and high disposable incomes of people. By registering a CAGR of 5.0% in the forecast period, the market in the region is projected to clock a revenue of US$1.64 bn by 2025. Europe trails North America in the gummy vitamins market vis-à-vis size. Alongside rising demand for the product, innovations in the gummy vitamins formulations are also stoking growth in the market in the region. One factor acting as a roadblock to the growth in the market is the strict regulations pertaining to gummy vitamins supplements in Europe. The market is expected to pull in revenues to the tune of US$741 bn by 2025. In terms of growth rate, Asia Pacific is anticipated to steal the show by clocking maximum CAGR of 3.8% from 2017 to 2025 on the back of robust demand for vitamin and dietary supplements from developing countries in the region. Some of the prominent players in the global gummy vitamins market are ABH Labs, LLC, Boli Naturals LLC, Vitakem Nutraceutical Inc., Ferrara Candy Company, Gimbal Brothers, Inc., Melrob Group, Makers Nutrition, LLC, Nutra Solutions USA, Contract NUTRA, Ernest Jackson, Bayer AG, and Sirio Pharma. The report also profiles major players (CMOs and key players) in the global gummy vitamins market based on various attributes such as company overview, financial overview, product portfolio, business strategies, manufacturing capacity and recent developments. Major players profiled in this report includes CMOs such as ABH Labs, LLC, Boli Naturals LLC, Vitakem Nutraceutical Inc., Ferrara Candy Company, Gimbal Brothers, Inc., Melrob Group, Makers Nutrition, LLC, Santa Cruz Nutritionals, Nutra Solutions USA, Contract NUTRA, Ernest Jackson, F. Hunziker + Co AG, Softigel By PROCAPS, Sirio Pharma and major manufacturer players such as BAYER AG, The Honest Company, Inc., SmartyPants Vitamins, Church & Dwight Co. Inc., Hero Nutritionals, Herbaland Naturals Inc., Life Science Nutritionals, Zanon Vitamec, Boscogen, Inc., Nature's Products, Inc., MDC Pharmaceutical Pvt. Ltd., Wellnext Health and others.